The Canadian Society of Landscape Architects (CSLA) announced the recipients of their national Awards of Excellence, and we couldn’t possibly be prouder to say that we are a recipient! 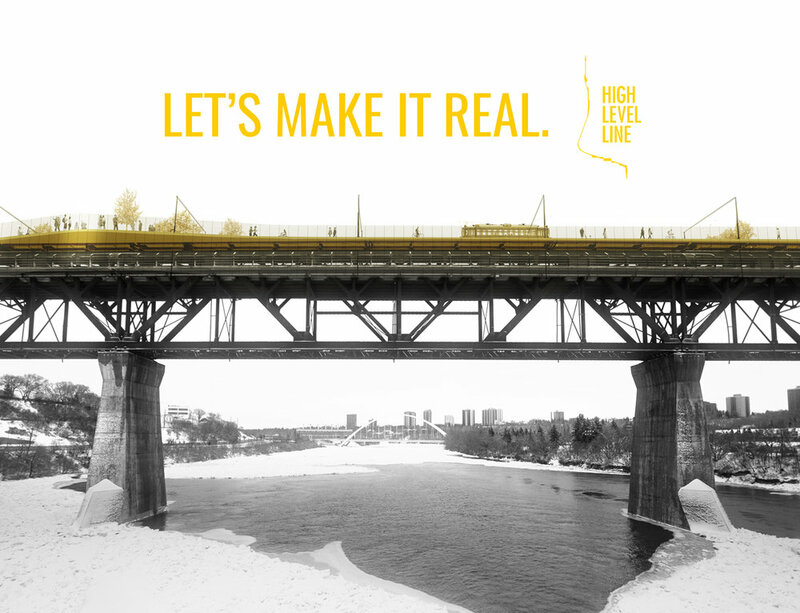 High Level Line’s bold vision for a linear park connecting Edmonton is the only Alberta-based project to earn national recognition. The award is a testament to the powerful potential of the idea and a major hat tip to the professionalism of our unsolicited proposal. We’re very humbled. High Level Line is one of 16 projects that are preeminent examples of Canadian landscape architecture. They illustrate the range of what landscape architects do and how landscape architects are helping to shape our communities—defining the places we want to live, work and play. We’re pleased to say our project is recognized in the communication category. A bold vision, illustrated to resonate with a broad range of viewers and strategically delivered, now has the potential to become reality. And being recognized for a design award on a national level is further proof that this idea is truly compelling and worthy of support. See all the winners of CSLA Awards of Excellence here. 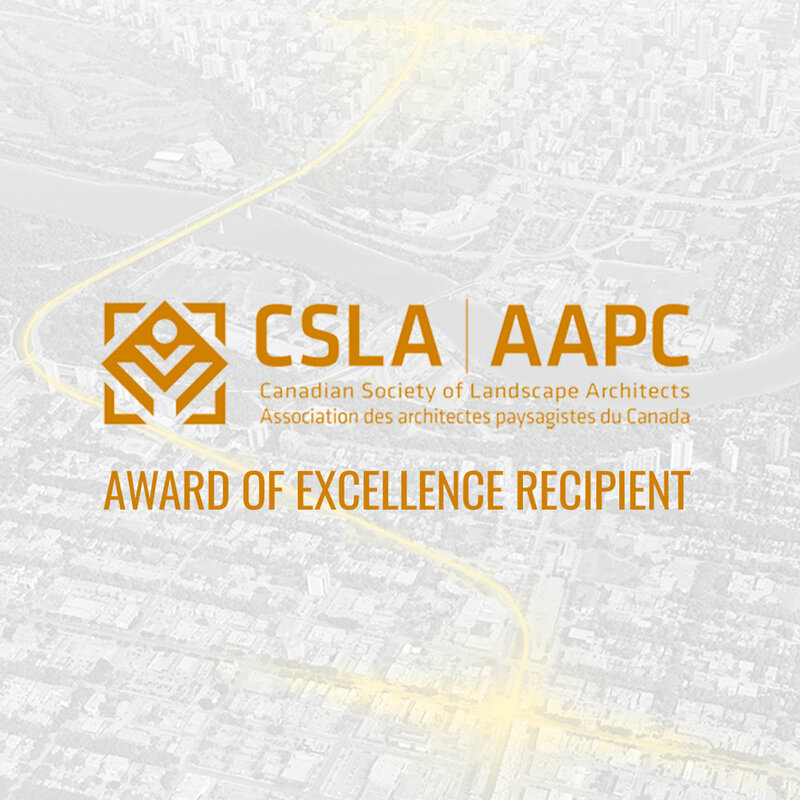 The Canadian Society of Landscape Architects (CSLA) is a professional organization with landscape architects, associate landscape architects, and students of landscape architecture as members represented by provincial and territorial associations. The CSLA accredits several academic landscape architecture programs across the nation. Landscape architects today are engaged in the design, planning and management of urban, rural and natural environments in all Canadian provinces and territories and in many countries worldwide. Canadian landscape architects are well-regarded for their vision, creativity, sensitivity and practicality in all aspects of professional practice, creating unique functional outdoor spaces for our citizens, as well as protecting and enhancing the environment. The CSLA is the organization which gives landscape architects a national voice and, though its provincial component associations, regulates the profession of landscape architecture through licensing or certification of its members. What's going on with High Level Line? It’s coming up on 18 months since we launched the vision of High Level Line. 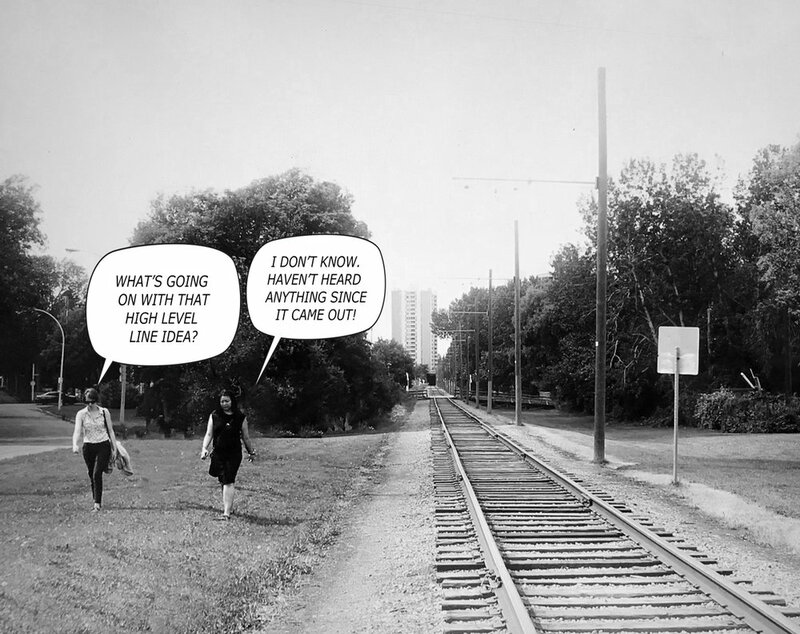 Before we unveiled it, we researched the area for a whole year and refined the idea to be something that sparked the imagination of all Edmontonians. And whoa, did it ever spark! When we launched it, our idea of success was having a few people tell us what they like or dislike about it. We had no idea it would take off like it did. But we’re sticking with it, and we’re more committed than ever to making this dream a reality. So what have we been up to exactly? To put it mildly, we’ve been… busy. Really busy doing everything we can to make High Level Line real. Lots of learning as we go. And to be honest, what we’re up to now isn’t as visually interesting as those early renderings, so we haven’t been as good about sharing the progress. But that stops now! Here’s a breakdown of what’s been going on with High Level Line. We hit “publish” on the website and populated our social media late on a weekday. 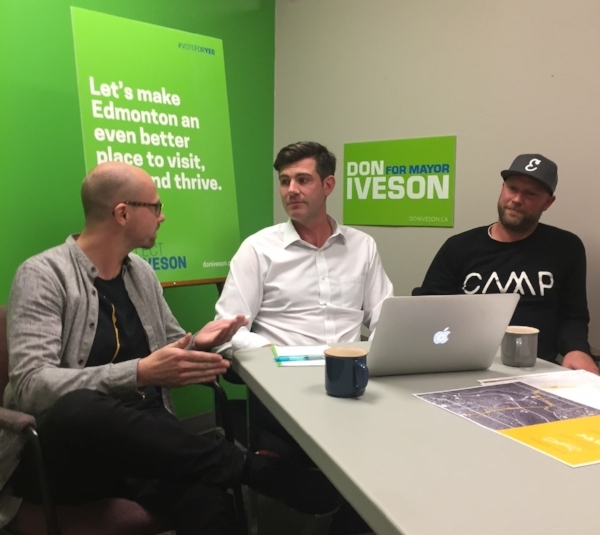 In the morning, Mayor Don Iveson saw it and graciously shared his support. It was either that or our press release that caught the attention of seemingly every media outlet in town (okay, it was obviously his tweet). It was a whirlwind. From that, you told us loud and clear that we’re not the only ones who think it’s a good idea. So we kept the momentum going. We’ve been invited to share the High Level Line Vision (and build upon it with guests) at a handful of design-related events. We’re looking at you, AALA, APEGA, Urban Week, and PLACE18 (a national urban planning student conference). High Level Line won’t happen overnight. It’s going to take a concerted effort for many years. We formalized this by establishing a non-profit society (High Level Line Society) with the purpose of fundraising, advocating and stewarding the vision of a better connected city core. Stay in the know and help us build momentum by signing up to be a member of the society. It’s free. Tell your friends too, please. To officially kick off the High Level Line Society, we held a launch party. We crammed supporters into The Common and asked for feedback on the idea while raising a glass to the potential of our city. 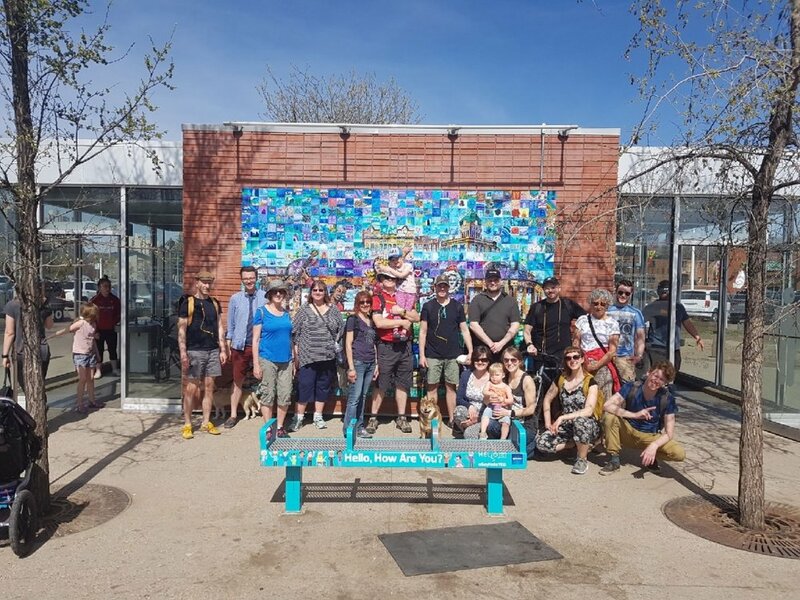 In the spring, we hosted a well-attended Jane’s Walk along the entire line and loved seeing the light in everyone’s eyes as we imagined the possibilities of High Level Line together. In the fall, we were honoured to be invited to be part of MLA Shepherd’s annual barbecue where we set up a booth and heard from residents in Oliver. Most importantly, High Level Line has to be thoughtfully designed for the people, businesses, government and community groups that are connected to the line thrive. The bulk of our work has been engaging with these groups. We’ve shared the vision and discussed with many groups, but there’s still so many more to meet. Every time we engage with a new group, two things happen: One, their unique perspective brings to light even more benefits. Two, there’s always suggestions for more groups we need to talk to. So the list of stakeholders and people we want to connect with grows and grows. But this proves just how much High Level Line will be a connective thread. 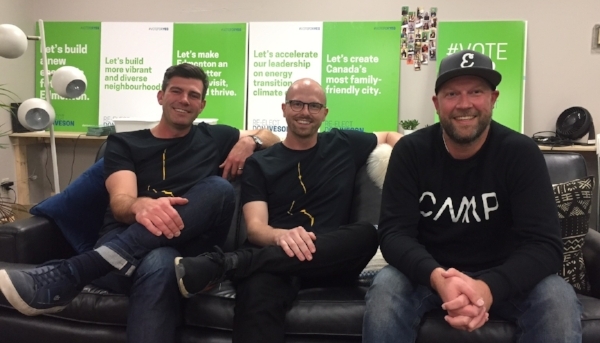 The five founding board members can’t do this alone, and plenty of Edmontonians reached out saying “how can we help?” Well, then. Committees made a lot of sense. We put the call out for volunteers in the fall, and we’re starting to find our groove with three committees: 1. Stakeholder Engagement and Fundraising, 2. Planning, Design and Activation, and 3. Marketing. 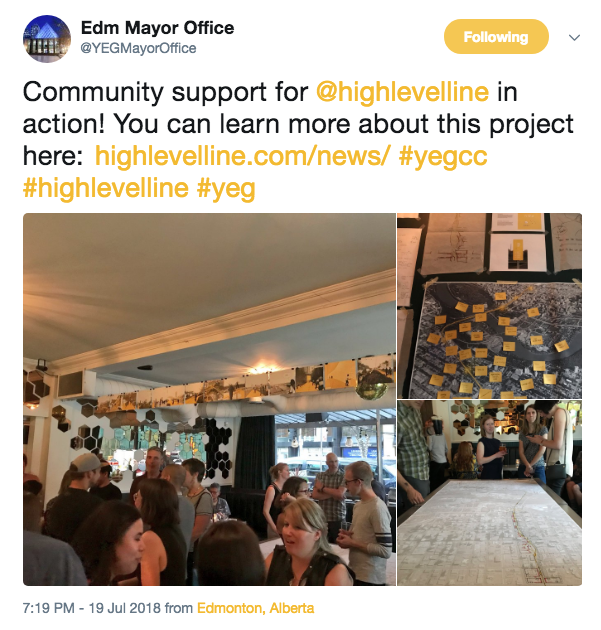 During the last City of Edmonton capital and operating budget deliberations, High Level Line spoke at the public hearing and asked for formal support for High Level Line. Councillor Henderson made a motion for City Administration to work with us on a report that explores the resources, roles and funding required to get this going. We’re working with Admin on that now and will be sharing it with council later this summer. Something else to look forward to! Thanks to the work of committees, we have some events and initiatives coming up that will activate the line and get it on the radar of more Edmontonians. Sign up to be a member of the High Level Line Society. Share the “Let’s Make it Real” images. Who else do we need to connect with? Philanthropists, community groups, anyone! Free High Level Line pins will be showing up in a few locations along the line soon. Finally, a heartfelt thank you for supporting High Level Line so far. It’s real, it just hasn’t been built yet. Over the past year, we’ve heard a lot of great comments and questions from Edmontonians. There’s something really special about Edmonton. If you have an idea, this is the place to share it and make it happen. There’s an appetite to make this city even better, and we have been blown away by the support for High Level Line. We’ve been spreading the word about the powerful potential of High Level Line, but don’t just take it from us. Here’s what Edmontonians have been saying about it! We want to hear from more of you. Tell us what you think of the project here. High Level Line t-shirts, anyone? 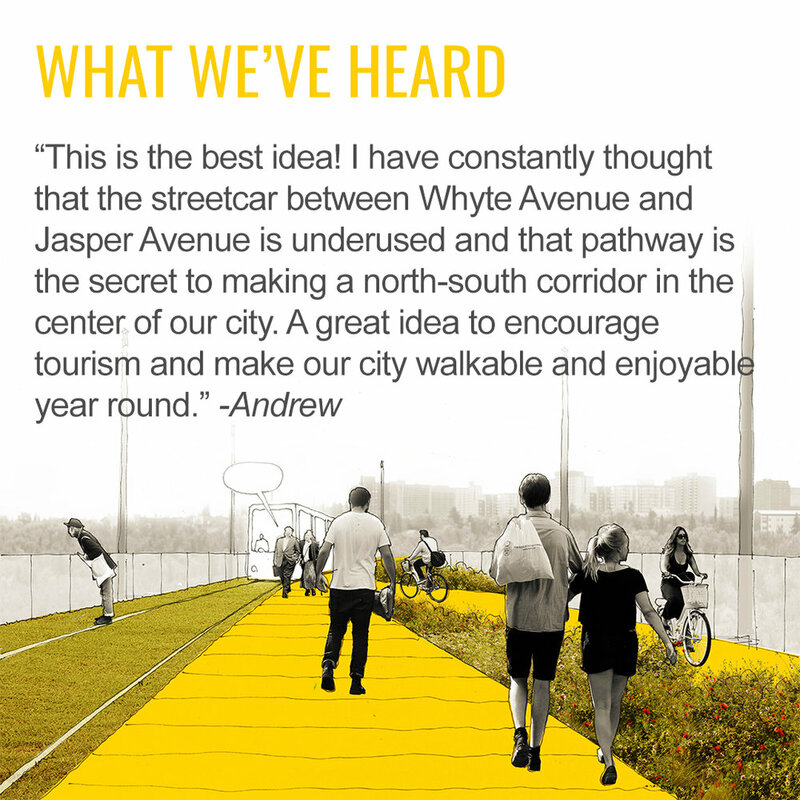 Love the idea of activating a 4km corridor between Old Strathcona and Downtown? Want to shout it from the rooftops? Okay, please do. Might as well wear a High Level Line t-shirt while you're at it. We have limited quantities available in mens sizes XS, S, M, L, XL, XXL (good for ladies too). Until we have our sophisticated online shop up and running, we'll do this a semi-old fashioned way: through email. Fill out the form below to get started and we'll respond by email with availability, payment and shipping details. Thank you! We’ll get back to you with availability, payment details and shipping coordination. We said we would host a party to kick off memberships, and it was better than we could have imagined! Engaged citizens from all walks of life joined us at The Common to kick start the official membership sign ups, talk about the idea, buy t-shirts, and raise a glass to the potential of our city. On the walls and tables, we asked for input along the entire line (on a giant map) and on specific areas of the Line like the High Level Bridge. We held a t-shirt raffle to kick off fundraising towards future High Level Line activities including awareness, advocacy, and design studies. It was a lot of fun, so thank you to all who came out. We couldn't believe the turn out! The place was packed, and we loved hearing questions from all the guests. Commonly asked questions were about LRT alignment (which is still up the air as Centre LRT plans are in the works), and wondering how to help out. We'll explore some of these topics in upcoming news posts on this website. Next steps: we are holding an AGM in the fall (likely October) and collecting names for future volunteer opportunities. Part of our AGM will be announcing and signing up sub committees. We were so impressed by the crowd that came out for the Jane's Walk this past weekend! Thanks to everyone who made it out and had great information to share. It was a beautiful day to walk from downtown to Whyte. We started our walk at the north end of High Level Line, between MacEwan University's Robbins Health Learning Centre and the new Allard Hall. From there, we walked the whole line south through Oliver, Grandin, across High Level Bridge (no, not the top of it), Garneau, and ended in Old Strathcona. What's a Jane's Walk? It's a free, citizen-led walking tour that honours the memory of Jane Jacobs, a visionary urbanist that pushed for people-centred communities. Learn more about Jane's Walk here. We were so happy to sit down with Elise Stolte from Edmonton Journal to share our vision of High Level Line with her. Six of us met with her at District and she feverishly wrote notes while we explained what we have in mind. When it came time to see the printed article, we were so thrilled to see that we were featured on the front page! Thanks, Elise, for helping us raise awareness of our proposal. 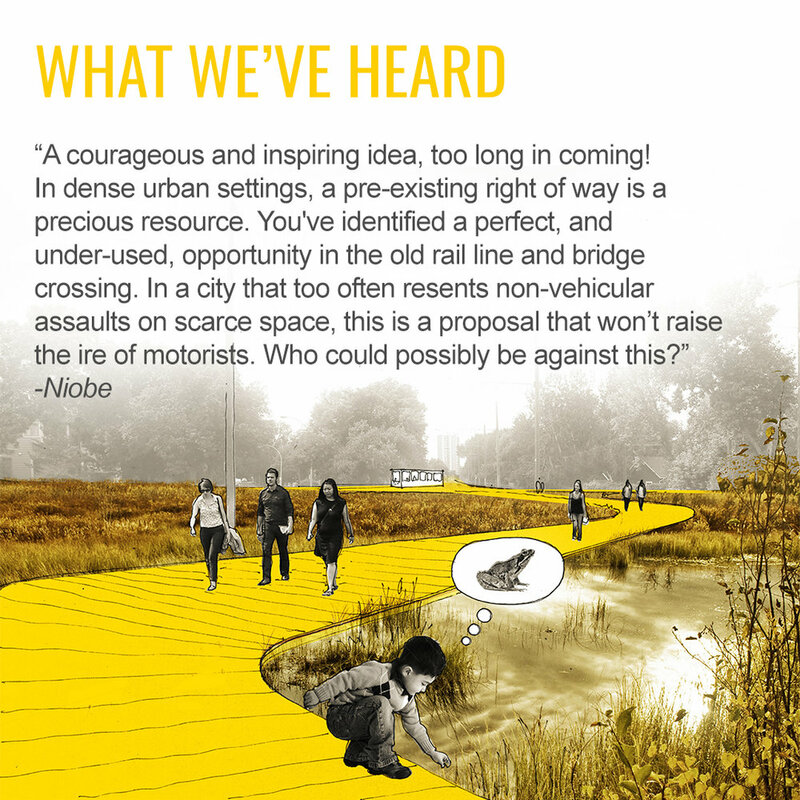 A dream to transform the High Level Bridge into an urban park and streetcar corridor that reaches from MacEwan University to Whyte Avenue is about to get its next big push. The young professionals behind the High Level Line concept are incorporating as a non-profit this spring, recruiting a larger board, launching a series of public events and meeting with landowners along the line as they work to build momentum. There are obvious challenges to selling the idea. But with consulting engineers now saying that the top of the High Level Bridge cannot be used for a future LRT line, the concept doesn’t have to compete with other transportation initiatives for the turf. 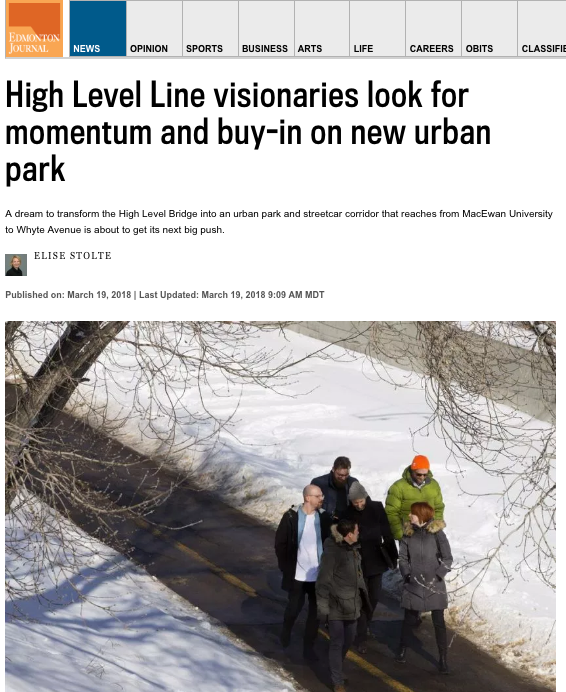 Postmedia sat down with six core members of the team to learn more about what they’re pitching for the High Level Line. We're excited to host a session at the APEGA Conference! 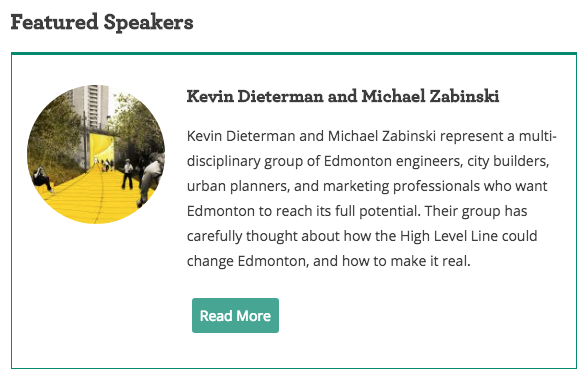 Two of us from the team will be sharing the story of High Level Line and discuss how to contribute to Edmonton reaching its full potential. 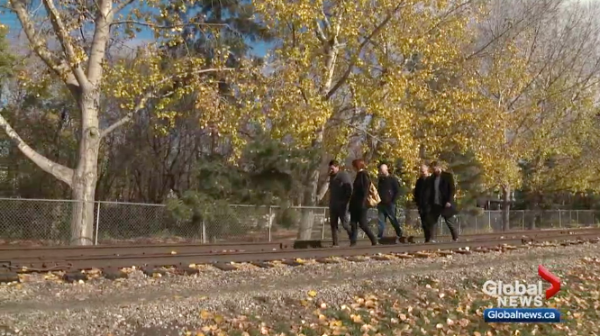 Kent Morrison from GlobalTV joined us in Old Strathcona to talk about High Level Line. 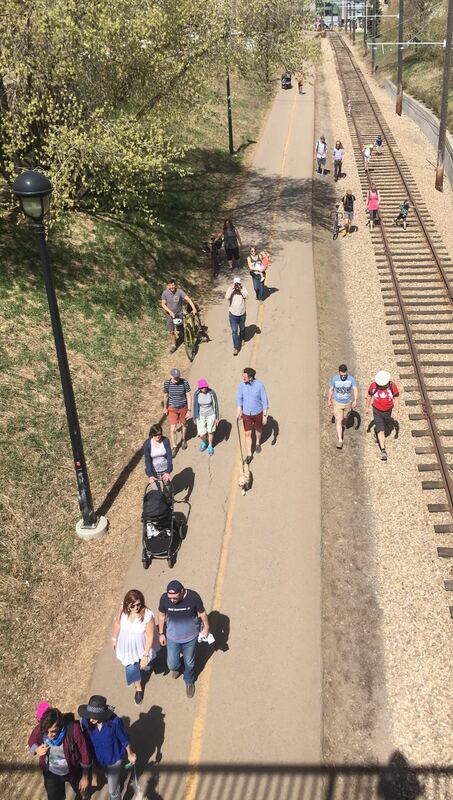 More than four kilometres of walking and cycling trails, including a streetcar track, through six neighbourhoods connecting downtown Edmonton to Old Strathcona. That’s the vision of a new idea called the High Level Line. “Right now it’s technically possible. You can get across in whatever modes we’re talking about but it’s not really a great experience,” said Kevin Dieterman, a landscape architect involved in the project.